I am feeling restless my dear fellow bloggers and readers.! I thought the warmer weather would scratch this itch that I have, but alas it has not. I am still dreaming of Mexico.! I fantasize about roaming the streets of playa drinking my way from one lovely bar scene to another. Finally ending up dancing the night away.! Because I’m daydreaming, I am unable to write. I just think about running free. So today, I leave you with my favorite bar crawl in playa because that’s all that’s on my mind. This weekend, I am going on a bar crawl complete with dancing.! So hopefully that will be just the boost I need with no flights to playa necessary 🙂 Enjoy.!! Endless beaches, amazing ruins, exciting excursions and fabulous food are the reasons many travelers visit the Riviera Maya. 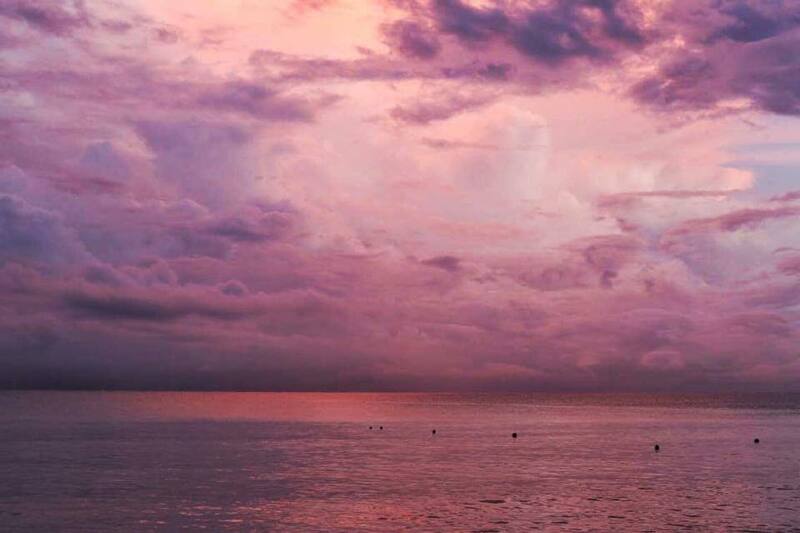 But admit it; another motive beckons you to the warm Caribbean breezes found in paradise. You want to have liquid fun! Not to worry, I promise I won’t divulge your secret. After all, what happens in Playa stays in Playa! In fact, I will share a little secret with you. I know the best places for you to partake in liquid fun while you relax, enjoy the scenery and people watch. Of course, I was not always such an aficionado. I got lucky on my first visit to Playa del Carmen. I met a local who took me and my friend on a tour of the best places to have liquid libations. After I moved to Mexico, I became a local myself and was able to seek out incredible bars on my own! 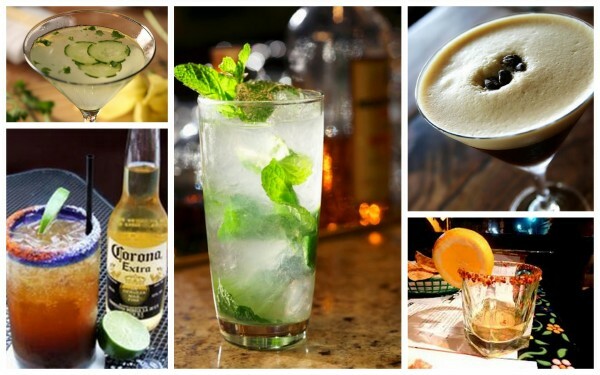 There are so many bars in Playa, and so many different types of bars, where you can enjoy a tasty beverage. Therefore, this list only encompasses my favorite watering holes in Playa del Carmen broken down by the time of day. Just in case you want to start early, end late or jump in somewhere in the middle! Beach clubs – The best beach clubs offer you soft sand, a comfortable beach chair, incredible service, good food and drinks! Lido Beach Club is my personal favorite! It is located on the beachfront between Calles 10 and 12. Lido Beach Club is a more intimate experience than some other beach clubs because after a few visits you will feel like family. The owners are a lovely German couple (and their daughter) who moved to Mexico many years ago. The family is warm, charismatic and super friendly! In order to unwind on one of the signature lime green chaises, you need to spend at least $10, but it is worth the small fee. Otherwise, you can choose a table under one of the palapas or sit at the bar in one of the chair swings. The food is yummy especially the fish tacos and the potato wedges with chipotle sauce. Also, they always have drink specials in the afternoon. Kool Beach Club is another favorite of mine. I became acquainted with it because one of my friends worked here for a spell. We would visit him on our days off. The beach at Kool, located at 28th Calle and the beachfront, is one of the most beautiful. There are no boats in the water to interfere with swimming as in some other beach locations. For a nominal fee, you can rent one of the lounge chairs or oversize beds which are extremely comfortable. There is also an infinity pool, gelato shop and massage services. Plus the ceviche and carpaccio are phenomenal and the service is stellar! And there is always a DJ playing super cool music! 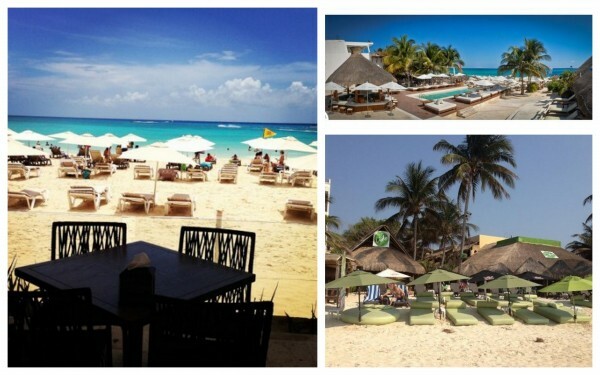 Mamitas Beach Club is also located on 28th Calle and the beachfront. It’s basically a martini olive throw from Kool. It also has an amazing sandy (not rocky) beachfront. The chaise lounges and beds are delightful. The staff is attentive as well. The food and drink are delicious. So what is the difference? Well there is no infinity pool. However, Mamitas is the original beach club in Playa del Carmen. So if you are looking for the grand dame rather than the new kid on the block, Mamitas is for you! Sunset bars – The best sunset bars offer breathtaking views of the sunset or great people watching in amazing locations. Since, the beach clubs close at sunset, you need to find another outlet to keep your vacation in full tilt. La Azotea has to be one of my most favorite bar eateries. It is a wonderful place to enjoy a stylish pre-dinner cocktail as you listen to the cool DJ sounds and watch the sun set over the Caribbean. La Azotea is located on the fourth floor of the Hotel Punto and therefore has spectacular views of the sea and Cozumel. If you do get peckish, it also has innovative Spanish dishes with a Mexican twist. Either way, this cosmopolitan scene is a marvelous experience! Zenzi Beach Bar is the place to go if you want to watch your sunset from the beach. Unlike other beach clubs, it is also a full service restaurant and bar. Therefore, it stays open very late. Zenzi has a great atmosphere. It’s relaxed, fun and friendly! The owners are always present and part of the expat community, so it’s a huge expat hangout too. There is always live music and dancing. The menu consists of tasty Mexican and international influences. I recommend the nachos and fish tacos. They also have great barbeques on Sunday. Clandestino by Lateral is the sunset bar to go to begin your evening in secret. Beautifully hidden on Calle Corazon under tropical trees and romantic lighting, this enchanting bar is divinely illicit. The bar serves exquisite cocktails while local musicians weave musical spells to start your evening festivities. Since the bar is an extension of Lateral, you can always order off of their delicious menu. The oysters Rockefeller and the French fries with truffle oil are delectable especially paired with a ginger martini! After dinner bars – The best after dinner bars offer exquisite cocktails, great conversation and amazing people watching! 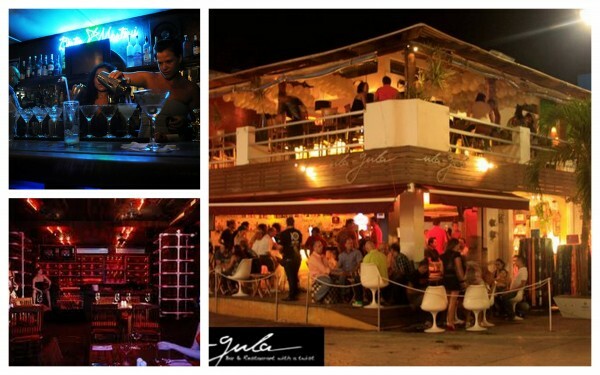 Ula Gula Bar with a Twist has prime real estate on the infamous Quinta Avenida and Calle 10. It is one of the best places to people watch! However, its corner location also provides the enviable position of being admired by passersby! Enjoy their sublime drink menu as you people watch from the comfort of your chic surroundings. 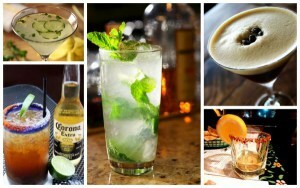 Their mojitos are my personal favorites with just the right amount of rum, mint and sugar! However, their espresso, kiwi and cucumber martinis are also delightful. If get hungry, try their gazpacho or Volcano wood oven pizza. You can also enjoy the hip atmosphere from the second floor. Dirty Martini is not your quintessential martini bar. For starters, it is located on 1st Avenida between Calle 10 and 12. Dirty Martini is one block from the beach and you will find sand on the floor and many people in flip flops and beachwear. However, the martinis are exceptional. My roommate and I attempted to try them all. But we never succeeded because we ended up having favorites. I suggest trying the pomegranate, watermelon, cucumber, espresso and chocolate! Tuesday nights, martinis are half off and on Thursday nights its ladies night with half drink specials. Not to worry if you are not a martini fan, they have specials on beers too! Also, it has great people watching from the outside chairs. Reina Roja is a very recent addition to Playa del Carmen. The completely modern and eclectic hotel is located on Calle 20 just off of Quinta Avenida. The bar is also a marvel bathed in red hues and featuring life-size mannequins. 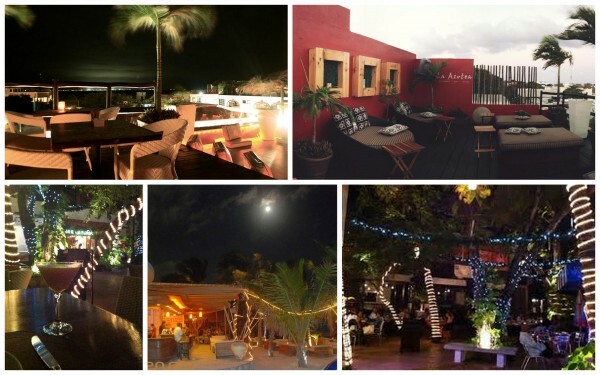 The vibrant ambiance is further enhanced by DJs spinning tracks, people watching and an impressive cocktail menu. The service is impeccable and the food is worth trying. If that was not enough, check out their Roof Garden which offers amazing views, a beautiful pool and a unique experience atop a daring hotel. Some of the best pool parties happen at Reina Roja! Late night bars – The best late night bars get your adrenaline pumping, offer outstanding libations and let you mix and mingle! Plus they should all be located in party central in Playa! La Mezcalinna is the bar I return to again and again when I am out late. It was one of the first bars I ever went to in Playa, so it holds a special place in my heart. 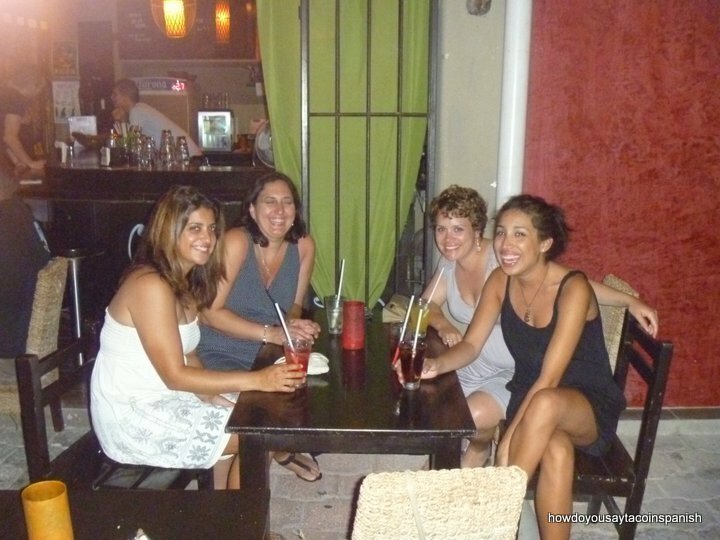 It’s location on Calle 12 between 1st Avenida and the beach is ideal people watching. However, its seemingly endless and excellent selection of Mezcal could also be a draw! Mezcal typically has a strong smoky flavor and it is usually served neat with orange slices and red pepper! However, it can be sweet when it comes in flavors such as coconut. Then it is outstanding! Another win for La Mezca is the excellent DJs who play there including one of my friends. The energy and vibe of this bar make it a popular local bar too! Mandala Club is the place to go dancing when you are in Playa! This trendy club, located on Calle 12 and 1st Avenida, has three floors decorated in an Asian theme complete with huge Hindu statues. DJs on the ground floor and the mezzanine spin the latest hits while locals and tourists alike dance to the pulsating rhythms. There is an impressive drink menu and bottle service is also offered. If you need to take a breather, there is an open air terrace where you can listen to music while reclining in the cozy lounge area. 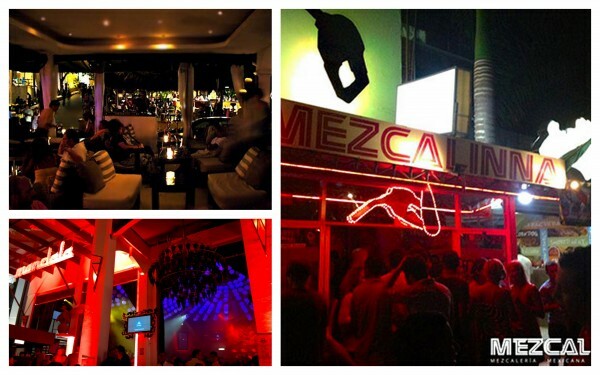 Mandala Club is the place to be in Playa after hours! Kartabar is a sophisticated late night alternative. It’s perfect location on Calle 12 and 1st Avenida allows fantastic people watching without the crowds while enjoying an exotic cocktail. Comfy sofa chairs promote conversation in a relaxed atmosphere; while, ringside seats promise plenty of exciting live action. Kartabar offers Lebanese cuisine and has an extensive drink menu. Also, the bar has many varieties of shisha (hookah). It’s a perfect way to end an evening of drinking. drinking with my friends at wana bar courtesy of my friend P.T. There are so many more bars in Playa de Carmen that are amazing. I will have to do a part two! But the aforementioned bars are truly my favorite places to enjoy the sun, have a luscious cocktail, catch up with friends and view my stunning environment. In fact, my perfect day involves micheladas and fish tacos at Lido Beach Club, then moving next door to Zenzi for mojitos, walking up the block to Dirty Martini for an espresso martini and finishing the night sampling Mezcal at La Mezcalinna. Or, no wait, maybe starting out the day at Kool drinking margaritas and ceviche, then walking over to La Azotea and watching the sun set while imbibing a cucumber martini. Afterwards, strolling down Quinta to Ula Gula and having a delicious mojito and finishing the night out at Kartabar watching the crowds! Or maybe… You get the point, the options and the liquid fun are endless in Playa! Salud.